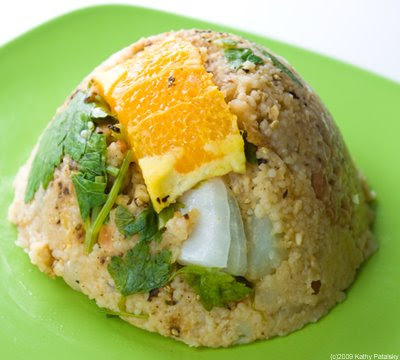 Wiki-Wiki Volcano Couscous. Fun. Kid-Friendly. Whole Wheat Couscous. If you are still using white grain couscous, think again. As you may know, couscous is imply tiny beads of pasta. 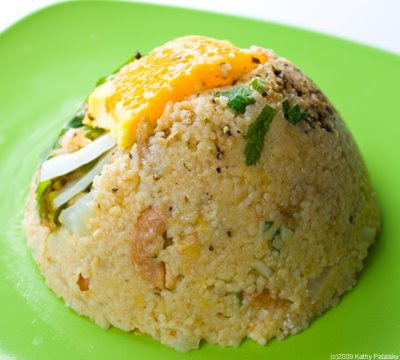 It cooks incredibly quickly and is easy to eat and customize with various flavors. But many stores are now selling whole wheat couscous. Just like regular whole wheat pasta, it is higher in fiber and nutrients. I actually think the nuttiness makes it taste better than traditional white grain couscous! So first and foremost, get the whole wheat version of couscous. Volcano Sauce Lava. I used Traders Joe's Sweet Chili Sauce as my lava. But you can find many variations of red sweet or sour or spicy chili sauce. You could even use a plum or tomato sauce as the lava. Just as long as it is orange, red or yellow the theme will work! You can even let the kids pour their own lava sauce over the top of this exploding mountain. optional: Use pineapple instead of orange if you want an even more tropical flavor. *I used a Trader Joe's brand. It had a very mild chili flavor with a lot of sweetness. A little goes a long way. In a sauce pan heat water/broth, oil, salt and pepper. Add in chickpeas, cashews, half of the onion, agave syrup, half of the parsley, garlic powder, bay leaf, orange juice and optional tofu. Cover and let boil for 1 minute. Uncover and add in couscous. Allow to cook for 1-3 minutes. Re-cover and turn off heat. Uncover, liquid should be absorbed. Fold in raw orange slices and the remaining parsley and onion. 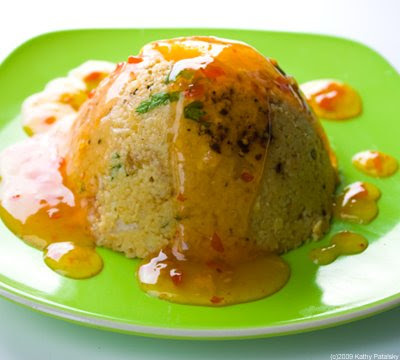 Spoon couscous into mountain/volcana shaped cups. Cover with serving plate and allow to sit for a few minutes. *I used a small sized coffee mug I bought at Le Pain Quotidien. When you think couscous has molded-about 5-10 minutes sitting, flip over plate. Gently remove cup and couscous mountain will be left. Sprinkle a bit of fresh pepper, parsley or salt on top if you'd like. 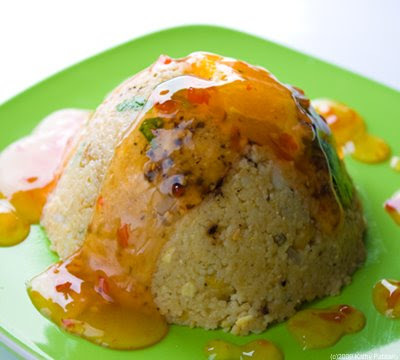 You can pour the 'lava' sauce on top yourself, or plate it next to the plate for the diner to pour themselves. Bowing to the Volcano Tiki Gods before eating is always a good idea. (Well, it's fun anyways.) You can even make up your own tiki song to sing before eating. Luau post or pre meal is also a fun idea. Itunes has many Tiki Hawaiian music to play at your feast.